Burg Nassau, or Nassau Castle, is considered the ancestral home of the Nassau family. Today, the castle, perched 120 meters (or almost 400 feet) above the Lahn River, consists of two main parts: a tower, which 33 meters (or 108 feet) and a palace. Both contemporary structures are reconstructions of the original buildings. 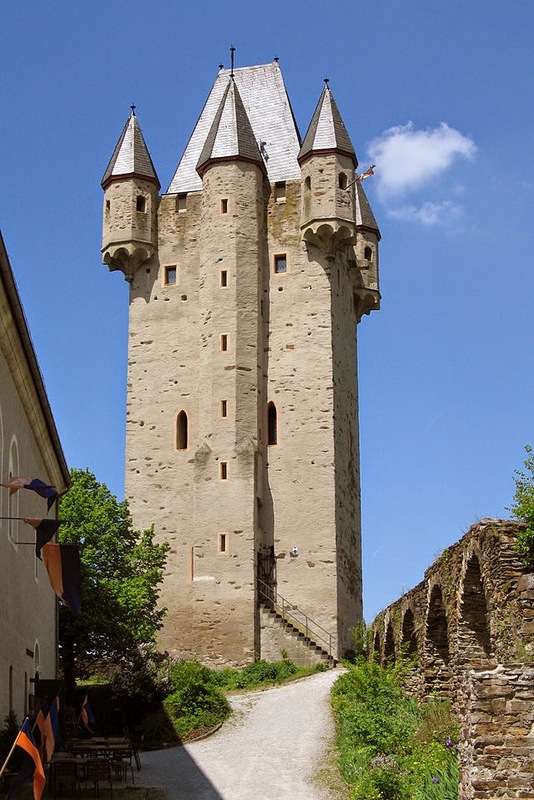 The tower of the castle was commissioned by Count Dudo-Heinrich of Laurenberg. He was the son of Robert, who was the vogt of the Archbishop of Mainz. The role of vogt, based on a word that originated from the Latin advocatus, was one that encompassed both political and military protection within a clerical territory. Dudo-Heinrich is now considered the founder of the Nassau family, but this position did not come without conflict. Today, historians tend to concur that construction of the original tower began around the year 1100. There is documentation to suggest the castle was already built by 1093, but historians consider the supporting document to be a forgery and this date to be unreliable. The construction of the tower immediately placed the count into dispute with the diocese of Worms The diocese, which was headed by the Bishop of Worms, claimed that the new structure was on their land, but the count continued work all the same. It should be noted that this was not the first time Dudo-Heinrich found himself up against a clerical territory. His political support eventually found him in dispute with archbishops in Cologne, Mainz, and Trier. Dudo-Heinrich died in 1123, but his sons assumed his political aspirations. Both Ruprecht I and Arnold I, co-Counts of Laurenberg, planted themselves at Burg Nassau. It was Count Robert I who styled himself "Count of Nassau," a title that the Bishopric of Worms denied to acknowledge until 1159, when Dudo-Heinrich's grandson Walram I was officially granted the title. Count Heinrich II, known rather fortuitously as "the Rich," was the son of Walram I and thus the great-grandson of Count Dudo-Heinrich. Around 1220, he commissioned a large palace to accompany the tower, and work on it continued for about a decade. A keep was later constructed in the 14th century. Heinrich divided the role of Count of Nassau between his sons Walram II and Otto, and it is from the lines of these brothers that the modern members of the Nassau family trace their descent: Henri, Grand Duke of Luxembourg, hails from the Walram line, while King Willem-Alexander of the Netherlands is a member of the Ottonian line. Additionally, all cities, towns, and other regions bearing the name of Nassau (such as Nassau, Bahamas, and Nassau County, New York) – but one – reflect the Nassau family. The one exception in this case is a village in Saxony that is located near Dresden. A document from 1346 indicates that a second tower might have been added to Burg Nassau at some point, but no further information remains about it. Any second tower has long since been destroyed, and there is little even in the way of ruins to suggest its existence. The counts of Nassau held Burg Nassau as their seat of power through the Middle Ages, but the family relocated to other castles and palaces (including Schloss Biebrich and Stadschloss Wiesbaden) as the decades progressed. 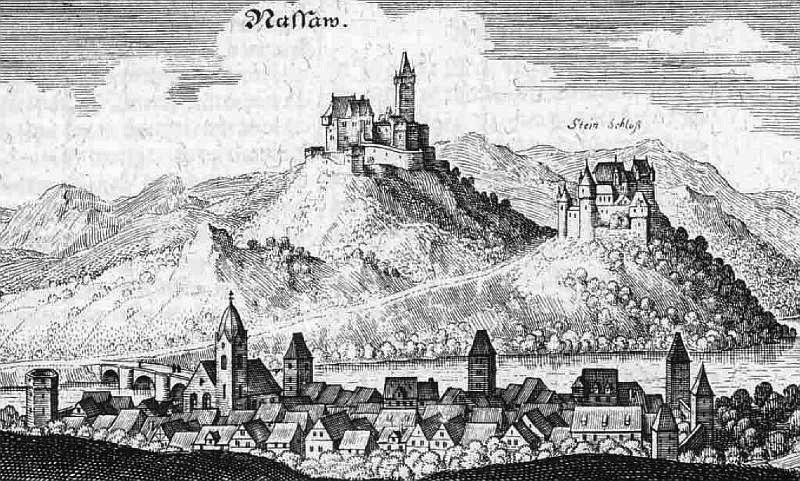 A 17th-century engraving by Matthäus Merian the Elder points to Burg Nassau still being proudly intact at that time, but in the centuries to follow the castle fell into disuse and decay. The end of World War II saw this once-impressive structure in almost complete ruin. 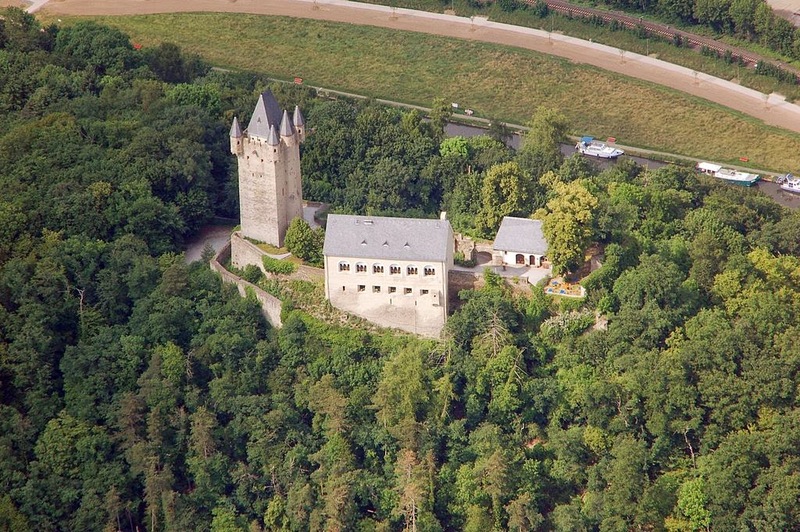 In 1965, the Staatliche Schlösserverwaltung Rheinland-Pfalz, or State Castle Administration of Rhineland-Palatinate, took over possession of the castle, and in 1976, they undertook a large-scale reconstruction project that rebuilt both the tower and the palace. Today, the keep of Burg Nassau is open to tourists, free of charge, while visitors can enjoy a restaurant in the main building. What is more, the Registry Office of Nassau makes several rooms of the castle available for weddings, and a variety of medieval-themed events are also held there throughout the year.